This is the Eye of the Tiger Espresso brought to you by Equator Coffees & Teas. Unlike their year-round espresso blends, Equator doesn't attempt to maintain a fixed flavor profile for Eye of the Tiger. Instead, they work with in-season coffees to develop a blend that shows off the unqiue flavors of the components. Together these coffees produce a sweet-toned espresso with notes of raspberry, cherry cordial, orange and milk chocolate. Just ok. Round flavor profile but with some bitterness I couldn’t dial out. Maybe because it was an espresso blend I was expecting more punch, crema, and overall sweet balanced flavor. There was a slight bitterness in the extraction that I couldn't seem to work past but it's was a good overall coffee aside from that. Its a good coffee nothing to exciting about it, Pulls a good shot and works well in milk, it mostly hits one note and stays there. I am really really enjoying this coffee... and i love the complex rich tastes it has. It was perfect on this 20 degree morning. I got a new grinder and now i can grind for french press or my regular drip grinder. It's great in both. I do really enjoy the flavors more in the french press but that's not always possible in the mornings. It was a great first choice and i am glad i still have some left. Great! Even better cold brewed than hot but great both ways! I enjoyed this. I'm not sure how to write notes. Any suggestions on things I should be noting when drinking coffee? I wouldn't mind trying to learn more about writing meaningful reviews. Maybe a blog post I can review and try? This was a darker roast than I prefer, and the caffeine buzz was more harsh. I did like the complexity of the flavor, once I got past the darker roast flavor. We're on the right track, but let's switch from medium to light roasts. Thank you! Great! Enjoyed from beginning to end. Wonderful complexity and balanced. A bit more acidic than some of my normal favorites, but excellent in all regards. I very much enjoyed this bag. It was very complex which made for a unique experience. Has a "bright" flavor, almost tart. The citrus-y notes really come through and is a great coffee to start the very early mornings with. Enjoying this as our first bag. Want to say its a home run but I want to try a few more before I were to decide. Off the bat the bag smelled wonderful. We enjoyed the complexity and chocolate tones. Right in line with the profile we would like. Smooth, low acidity and complex. What is up with all of this super acidic coffee. Maybe this is for someone else, but after trying batch after batch of mistobox coffees, every single one is way too acidic. AKA bright. I grew up drinking Pacific Northwest style dark roasts. So maybe its just me. It was pretty balanced all around, solid choice. Delicious but didn't blow our minds. Level of bean darkness was to our liking and none of the flavor jumped out too much. Nothing really unpleasant to report yet. Neophyte review coming: This was a great coffee. Tastes like it was comprehensive, and went together well. Very smooth, nothing jumped out as overly noticeable, like tart or bitter. Very strong flavor, holds up well to cream and sugar in a good way. One of the best espressos I’ve ever had. Quite dark and almost tasted burnt. Good for a dark espresso but did not taste the cherry or chocolate. Really loved this coffee. The roast color was perfect (medium) and tasted full but not burned. Would love to receive this one again. I am a bit biased to this coffee brand - I recently relocated from Tiburon, CA to Ohio and miss going to the Equator cafe in Mill Valley and at SFO. This was a great espresso, although I found the "citrus" notes to be a bit too much in the overall flavor. Made it feel a touch too acidic, especially in combination with milk in a machiatto/cortado. I thought this was a good cup of expresso. It wasn't too bitter, and it felt rather smooth going down. As opposed to many of the other espressos I have had, it didn't have that bitter punch that seems to drown out any other flavor; which was fantastic. It wasn't a test of strength to drink it, but a really enjoyable experience. The flavor profile is rather complex, and I can't exactly describe it. It was almost hinting at a chocolate orange. Overall, it is a very enjoyable and pleasant cup. The roast was great, we liked the flavors and the depth. The only downside was a little too much lime on the finish. I've had other coffees with citrus notes that I've enjoyed quite a lot but they didn't have quite as strong a note on the finish. Balanced, minimal acidity but no flavors that are prominent. Nothing that is memorable for me. Probably good as an espresso (as the name suggests), but too darkly roasted for a French press or pour-over. I'd give this somewhere between 3-4 stars, it just keeps changing every time I have it, so sometimes I like it more than others. It tastes really good in the espresso machine, but I like it less so as a pour-over. And I'm trying to wean from the espresso machine, so I prefer to aim for coffees best suited for pour-over brewing style for the time being. Really love the complexity of the beans. Not as bitter as other espresso roasts I've tried. This roast is a little too dark for me. As an espresso it's pretty good, leaning dark than medium, definitely needed to make this a milk based drink as an espresso. As a pourover, it was a rich dark coffee, best hot and black, or iced with milk. Eye of the Tiger has a great bold, but smooth flavor. Love it! Strong taste with a kick, sweet and creamy coffee. Nice on the paladar. Have tasted it only on my expresso machine. Gives nice with lots of crema expressos. Yummy. Best pour over I've made in awhile! I even botched one of my brews with a sloppy technique, and it still was legit! Love the flavor. After my having my second coffee sent, I really noticed how much i enjoyed this batch. thanks. Not the most interesting, but solid, well balanced blend. I'm a long time fan of Equator, but I was disappointed in this espresso blend. The taste was flat and lacking the sweetness I usually associate with good espresso. This review is being written as I take a shot of espresso made from these very beans. First notes are the citrus, not overwhelming, but very present. Then a more refined nutty caramel starts to work its way into your taste buds, which then finishes with a very earthy base of the shot with just enough brightness to wrap it all together. The shot alone was for sure top tier, but pair this with some perfectly steamed milk, right to its sweet point, and you have yourself a very delicious espresso drink. I prefer lattes and those nutty caramel notes carry through the milk and linger within the drink to make something special. I haven't gotten the chance to make it with a pour-over, but I will edit this review as soon as I get the chance. If you don't know where to start, the Eye of the Tiger is a solid starting point and I definitely recommend you checking it out at some point. I like this but couldn't diial it in to the point where I really enjoyed it. I don't like very bright coffees in milk drinks which was nice about this one but in the end I kind of found it boring and slightly one demrnsional. I didn't get the flavors that were described with it which would have been great! A very nice, smooth, creamy coffee perfectly roasted. No taste of bitterness. Love the flavor notes and the medium acidity. Love smooth coffees! This was my first coffee I received through MistoBox, and I am impressed! I'm not sure how to properly review a coffee, but here goes:I mostly made Eye of the Tiger as a cappuccino, with a few random cortados and straight shots here and there. I aimed for 18 grams in, 36 grams out in 25-30 seconds as my starting point, and honestly kept it there for the entire duration of the coffee!I really enjoyed it in every form - it was smooth, with low acidity (I really liked the combination of smoothness with low acidity), and its flavor shone through in all forms. It was a very bold flavor, something I also enjoyed. I'm normally partial to Central and South American coffees, while normally being hesitant about African, but in this blend, I think the Kenyan contributed some citrusy flavors with acidity, while the Costa Rican and Guatemalan coffees mellowed it out.Not super sure how to analyze the tasting notes, but using the SCAA flavor wheel, I would definitely say this coffee is more on the "roasted," "nutty/cocoa," and "sweet" side. Definitely nutty, chocolatey, and possibly caramelized? This is the side of the coffee spectrum that I like and am comfortable with! I am not a fan of floral, but I perhaps could do fruity. I really liked this coffee -- especially on the first day after opening the bag. Unfortunately. I didn't use it fast enough and the magic really wore off by the end of the week. 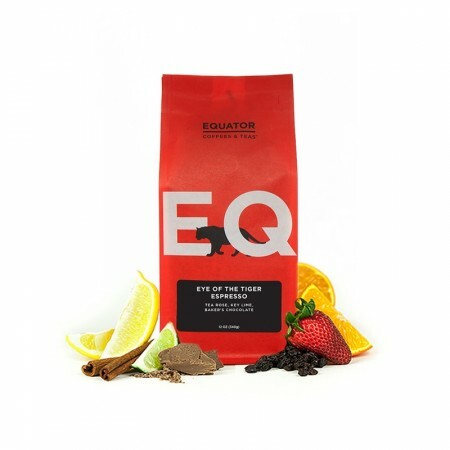 Loved that Equator is a "B Corporation" and how can you not love the name. Very good. Drank it black. Second brew had a slightly bitter aftertaste. Not sure why. Taste is good, soft, no bitter aftertaste, as expected from light roasted coffee it's sour, only thing is the smell little bit too sour, but I suppose 'cause of the same light roast. Very well balanced with nice notes of chocolate and caramel. Makes a good espresso and goes well with milk. A great blend - oily, robust, and a rich roast. Great in a French press any day of the week! This is a phenomenal coffee to make espresso with. The taste is well balanced and pretty smooth and the flavors listed on the front of the package can be tasted clearly.Overall it is an exceptional coffee and works really good with Mocha's (my favorite type of coffee drink). A mild to moderate strength tastefull espresso blend that functions well as a general purpose coffee as well as a dedicated espresso blend. Excellent espresso. Especially from day 8 on. The batch I received was different than the curators notes. This was a washed PNG, Costa Rica, and a natural processed Ethiopian. Bright and tart, the cherry flavor really popped. Strong "roasting" taste, not bad, but prefer stronger coffee taste to dominate my cup. Unique and adventure filled... complex and rich... delightful. These are good beans. The flavor profile provided is fairly accurate, i just wish it had more body. Extremely smooth when brewed in an espresso machine. Very low acidity with a full body flavor. I am not big on individual coffee notes of flavor, but I did get the cinnamon portion of the description. This is possibly one of my favorite coffees. The coffee is good but we need to make too many adjustments to our cups because it's too strong for what we are used to. There were nice subtle hints of chocolate, and it was a strong cup of coffee to wake up to in the morning without being harsh. This was very good. I would buy this again and loved the overall flavor and boldness. Solid espresso. Blends well with milk and has more spice than the Red Bird I drink. Agree on the chocolate and hazelnut notes. I'm looking for something brighter and with more fruit, and something that will stand out in milk. Very delicious. A very bold but yet very balanced blend. Extremely enjoyable. Has the dark roast I like, with a bit of smokiness to it. Overall, very good.I wish it had a little sweetness, like a caramel taste at the end. Very good espresso. 3.5/4This is a silky coffee with a mellow body. The fruit notes translated into an overall tartness that was a little overbearing for my preference. I prefer more earthy/intense roasts with low acidity. Still though, Eye of the Tiger is excellent espresso - it's just not quite for me. Nice nutty and chocolate flavors. I tend to favor espresso that's a little more fruit forward, but for what it is the eye of the tiger is solid! Well balanced. Rich and smooth. Lovely. This produces the most crema I've ever seen in an espresso. It's really rich - maybe too rich for normal stuff (pour over, etc), but it's definitely a great espresso. This espresso does well in a cappuccino. The flavors of hazelnut and chocolate are not too over-powering and the hint of fruit makes for a well balanced cup. The beans are incredibly fresh and I look forward to seeing how they change over the next few days as I get through my 1st bag from MistoBox. Tastes fine. Has a nice sweet, nutty flavor. Smooth and not too acidic. Sweet enough that no sugar needs to be added when making lattes. Very good espresso. I drank it on its own with no milk. I enjoyed the chocolate and floral notes, was not too bitter, very smooth. Nice smooth flavor with nutty hints. Sort of a mushy, unfocused palette. The fruit notes are muted by the relatively dark roast, and the nose was just boring. I tend to find espresso blends over-roasted, and this is no exception. But what was worse is that the blend seemed only to cover up anything interesting about any of the individual beans. I also have to admit, I'm disappointed to have received two blends in a row when I'm paying single-origin prices. A nice nutty espresso, with a some dark caramel-y notes, pleasant but not exceptional. I am in between Espresso makers at the moment. Drank it as regular coffee. I think it would make excellent Espresso. One of the best espressos I have ever taste! The tobacco finishing is just amazing.